[S3732] Email from Karen Von Allmen dated July 2016 to Hunter Wayne Bagwell; Subject Line: Email about Viola Bagwell's Family. [S684] United States Federal Census, Washington, District of Columbia, Population Schedule: Green, Grant, Indiana; Enumeration District: 169; Supervisor District: 6; Page: 22, Dwelling: 215, Family Number: 231, Date: 1880. [S696] Mary J Bagwell Grave Stone, Find a Grave, www.findagrave.com. [S830] United States Federal Census, Washington, District of Columbia, Population Schedule: Beaver Township, Pulaski, Indiana; Emuneration District: 86, Supervisor District: 13, Sheet: 3B, Dwelling: 49, Family Number: 49, Date: 1900. [S827] Email from Betty (Engel) Black dated May 21 2009 to Hunter Wayne Bagwell - Subject Line: Sarah Carolina Bagwell Family History. Harley Abraham Bagwell was also known as Harley Bagnell. He was born on 2 September 1890 in West Liberty, Indiana. He was the son of Francis M. Bagwell and Viola C. Hicks. Harley Abraham Bagwell lived in 1910 in Billington, Adams County, Washington. He married Myrtle Phillips on 28 May 1913 at Coeur d'Alene, Kootenai County, Idaho. Harley Abraham Bagwell lived in 1917 in Washington, Adams County, Indiana. He died before 1920. 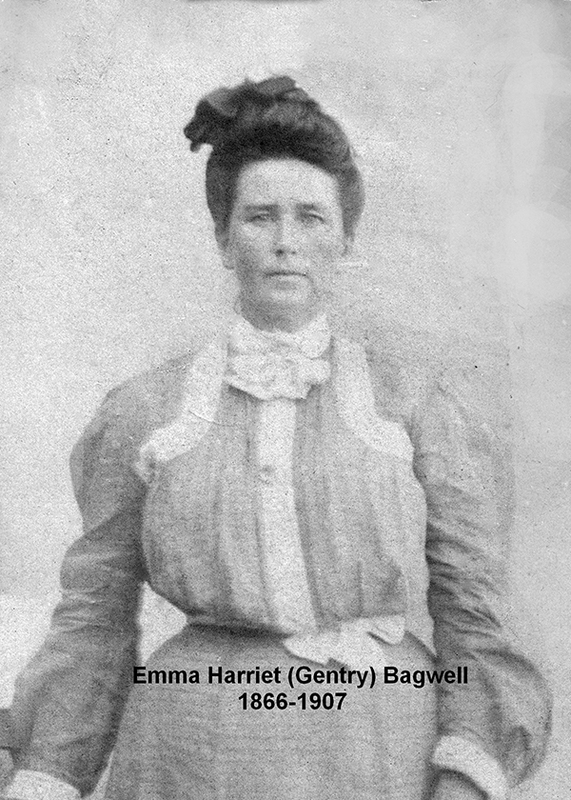 Inez Bagwell was also known as Inez Bagnell. She was born circa 1892. She was the daughter of Francis M. Bagwell and Viola C. Hicks. Leslie George Bagwell was also known as Leslie Bagnell. He was born on 2 June 1893 in West Liberty, Indiana. He was the son of Francis M. Bagwell and Viola C. Hicks. Leslie George Bagwell married Elsie Sjostrand on 8 September 1915 at Coeur d'Alene, Kootenai County, Idaho. 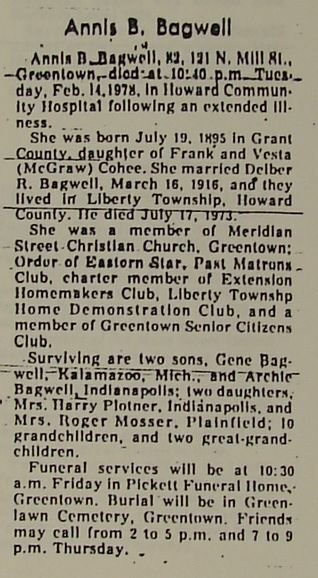 Leslie George Bagwell lived in 1917 in Washington, Adams County, Indiana. He died in 1966. He was buried at Pines Cemetery, Spokane, Spokane County, Washington. [S697] John W Bagwell Grave Stone, Find a Grave, www.findagrave.com. [S700] Dale Bagwell Grave Stone, Find a Grave, www.findagrave.com. [S701] Audra Bagwell Grave Stone, Find a Grave, www.findagrave.com. Children of Emma Harriett Gentry and Andrew Jackson Bagwell Jr.
[S771] Emma Harriet Gentry Bagwell Grave Stone, Find a Grave, www.findagrave.com. [S770] Nancy Sarah Delilah Taylor Bagwell Grave Stone, Find a Grave, www.findagrave.com. Gary Falsom Bagwell was born on 4 July 1882 in Greentown, Howard County, Indiana. He was the son of John William Bagwell and Sarah Ellen Carr. He was sent in the draft of Aug. 25, 1918, to Purdue University, and was transferred from that training school Oct. 27, 1918, to the ordnance section at Camp Hancock, Ga; then on Dec. 22 he was sent to Port Clinton Ohio, and assigned to Co. D, Erie Proving Grounds, and for a time before his discharge, July 31, 1919, he served in the military police. Gary Falsom Bagwell was buried on 3 December 1952 at Memorial Park Cemetery, Howard County, Indiana. He died on 3 December 1952 at age 70. Salome (?) 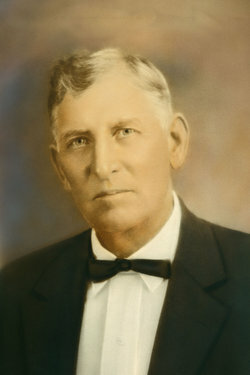 married Jacob Olwin. Her married name was Olwin. (?) Toy married Edna Pearl Bagwell, daughter of Milton Archabold Bagwell and Dora Belle Olwin. (?) Ward married Wilma M. Bagwell, daughter of Milton Archabold Bagwell and Dora Belle Olwin. (?) Kecht married Verna Arlene Bagwell, daughter of Milton Archabold Bagwell and Dora Belle Olwin, after 1930. [S4629] United States Federal Census, Washington, District of Columbia, Population Schedule: Liberty Township, Howard County, Indiana, Population Schedule: Liberty, Howard, Indiana; Emuneration District: 34-27, Supervisor District: 6, Sheet: 8A, Dwelling: 178; Family Number: 180, Date: 1930. Doris Aggeleze Bagwell was born on 29 December 1919 in Howard County, Indiana.1 She was the daughter of Delbert Ray Bagwell and Annie Belle Cohee.1 Doris Aggeleze Bagwell married Harry Roland Plotner on 24 April 1948 at Greentown, Howard County, Indiana. As of 24 April 1948,her married name was Plotner. Doris Aggeleze Bagwell died on 25 February 2011 in Greeley, Colorado, at age 91. Nancy Kay Bagwell was born on 3 October 1933 in Greentown, Howard County, Indiana. She was the daughter of Delbert Ray Bagwell and Annie Belle Cohee. Nancy Kay Bagwell married Roger Mosser on 27 February 1954 at Indianapolis, Marion County, Indiana. As of 27 February 1954,her married name was Mosser. Nancy Kay Bagwell died on 12 December 1993 in Plainfield, Hendricks County, Indiana, at age 60. Joan Bagwell was also known as Jo Ann Bagwell.1 She was born on 29 December 1921 in Greentown, Howard County, Indiana.1 She was the daughter of Delbert Ray Bagwell and Annie Belle Cohee.1 Joan Bagwell married Irvin Trowbridge on 15 June 1946 at Indianapolis, Marion County, Indiana. As of 15 June 1946,her married name was Trowbridge. Joan Bagwell died on 13 March 1977 in Palo Alto, Santa Clara County, California, at age 55. Otis Wallace Bagwell was born on 24 September 1886. He was the son of Andrew Jackson Bagwell Jr. and Emma Harriett Gentry. Otis Wallace Bagwell died on 14 August 1887. He was buried at Pleasant Grove Cemetery, Choudrant, Lincoln Parish, Louisiana.